Working on a cross-over dress with lining. w00t! Crafts, as a newly unemployed, fill the void somewhat. Or at least postpones the inevitable job-searching! BTW I’m free for lunches. 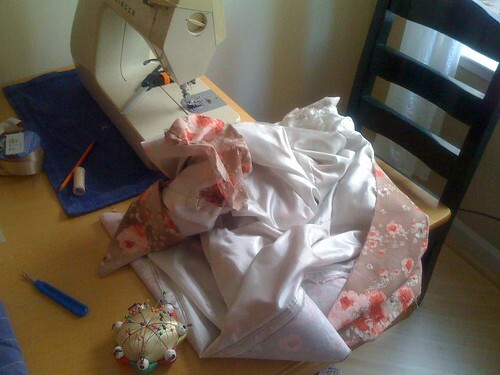 When I was 16, I wanted to be a seamstress. I thought my life would be perfect if i got a small Victorian in downtown San Jose and sewed wedding dresses all day. I spent a lot of time sewing, then, and sometime before I graduated high school and went to college, I decided it was a huge waste of time when you could go to CostCo and buy a pair of pants for 10 dollars. I didn’t really look back until last summer. Then, in a fit of strange creativity, I hand sewed a medieval dress- from a 14th century photo of a pattern, which is pretty rare since they didn’t use patterns a lot. My sister Jenny and I cut up pants, shirts, whatever, and altered them according to our (quickly changing) bodies, as well as just ideas we had of funky designs. This wasn’t fun for my Dad, who would discover his latest dress shirt torn to ribbons and resewn with another shirt of his- I can’t describe what they were like because they were all really odd. All of us girls are pretty good at sewing- and crafts in general. At a barbecue this summer I got to thumb through my other sister’s book on creative sewing- “Bend the Rules Sewing,” that was pretty inspiring. One of the first comments, “Don’t sew to save money.” And “Don’t worry about it looking homemade, it is homemade.” Haha. I borrowed her high-tech sewing machine and a cute little plastic foldout box, which is like a bait and tackle box, but for sewing. God, it is great to have all of the little tools you’re used to (except for my latest gadget that I want- a bias tape maker). The box was my grandmother’s, and as I use it I’m thinking about her a lot. She really loved lame, polyester, and anything filmy. She made these long, bright dresses for fashion shows of her charity group, called Eastern Star. Those outfits are still amazing dress-up clothes for my nieces- and they were for us as kids too. I’m lining my skirt & dress with polyester, and it does feel great, and you can wash it. Adding that extra weight to a piece of cloth makes it hang right, and it stays a fraction away from your body, with a smooth, crisp feeling when you take it on and off. I don’t have much lined clothing- maybe a suit jacket here or there. We’re surrounded by knits, which are just so unflattering too. Interesting, that in the age of cheap clothes, we prefer to diet and exercise to death instead of just wearing more flattering, comfortable clothes that are slightly more expensive. When I was in France I bought some clothes, and even with ready-made clothes, there’s a lot more measurements than we have. I’m reading up on how to fit your shoulder, and it’s an interesting exercise in negative space and three dimensional visualization. I can imagine that when modernism started and women started wearing less clothes, a whole lot of tailors and seamstresses flooded the market, along with industrialization and the loss of custom clothing. Of course fitted 1920s style clothing is nothing easy to do- dresses on the bias, and suits, are so hard. I have a few ideas for clothes I want- a funky polyester outfit I used to have, with dark red with roses all over, really 70s. Big lapels. I want this, but I can’t imagine wearing it at the same time. Other than that, just styles that I know flatter me- 3/4 sleeves, fitted shirts, skirts, stuff like that. It’ll be nice getting a wardrobe together again of good fabrics and styles. Written Tuesday, May 27th, 2008 in crafts, nostalgia. You can leave a response, or trackback from your own site.